2) アーリーチェックイン / レイトチェックアウトは可能ですか ? Great location - Bus just outside takes you to the Shibuya station. Host responds quickly whenever we contact him. Place is compact but nice and meets our needs. Great place to stay if you are visiting Tokyo. This was a wonderful location for three of us. Bus #55 right outside takes us to Shibuya. There's also an elevator which is a must with big luggages. Don't bring too many bags though as the apartment is very compact. This is Tokyo after all. Very clean and has everything we need and we were most impressed by how organized and efficient our host was. He sent us very useful tips and info more than a week before our trip and kept in touch from the time we arrived at the airport until we got to the apartment. Took the airport limousine to the Shibuya Excel Hotel and a cab from there to the apartment. We stayed a few days then visited Kyoto and Osaka and returned for the rest of our trip. We appreciated that we were always able to contact our host with questions. Highly recommend this place. We absolutely loved it. 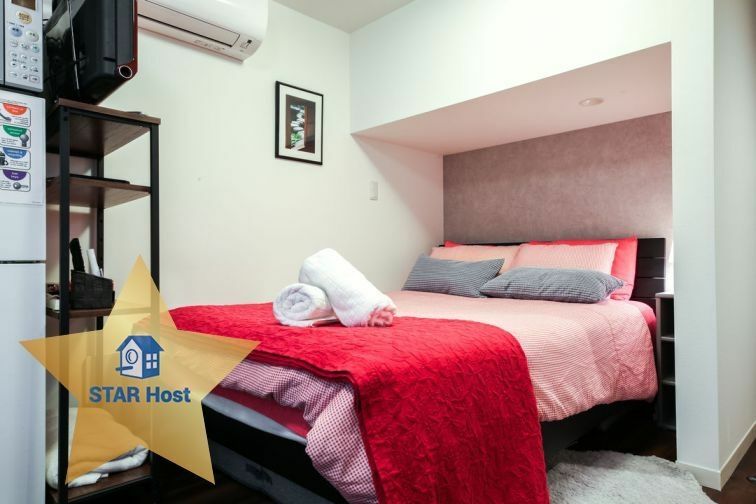 Lovely, clean, quiet apartment in Shibuya, near the University. A very pleasant 15 minute walk to Shibuya Crossing, through a peaceful, upscale residential quarter that spills into a hip neighbourhood dotted with bistros, bakeries, restaurants, coffee shops and boutique stores before the madness of the shopping district. A 10 minute walk to the Metro at Yoyogi koen — 1 stop away from the trendy shops of Harajuku; 12 minutes to the Commuter rail station at Yoyogi Hachiman that had us in Shinjuku in 3 minutes flat. The apartment borders a major thoroughfare, and hailing a taxi requires very little effort, but it's also lined with an impressive bike path that would cut travel time down to minutes. For a quick meal, the Chicken soup and Bento restaurants right across the street fit the bill; but just a little further north, south and east, we found everything from ramen to crepes to smoked lamb bacon sandwiches and some of the finest coffee we've ever tasted. DO buy a PASMO or SUICA card; and DO take advantage of the amazing rail and metro system that had us at the Great Buddha in Kamakura on the coast in just over an hour. We took full advantage of the portable Wi-Fi which functioned very well throughout our travels, and did turn to our hosts for advice when needed — which was very much appreciated. If fortune finds us in this amazing city with its wonderful people again, we'll come calling to Q House.